Agape Tile LLC is an artistic consulting and design company. We have specialized in aquatic design for over 27 years and have been creating murals for residential and commercial installations for over 34 years. We provide you with custom design options for swimming pool and spa interiors and exteriors and pool environs in a timely manner and at an affordable price. Our custom waterlines are typically delivered in two to three weeks. Simple murals in glass have a similar delivery point. Detailed hand cut murals may take four weeks to arrive. For all tile pools, please call us well ahead of your desired installation date. At Agape Tile we turn ideas into reality and transform concepts into completed magnificent installations. 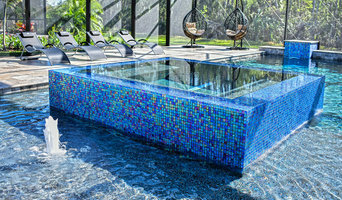 Materials used for your custom swimming pool and spa are glass, stone, ceramic, gemstone or seashell. Agape Tile offers a large selection of standard swimming pool murals, medallions and waterlines which may be customized by size and color in hand-cut stone, hand-cut and un-cut glass. Should you need field tile, we are distributors for Bisazza (discount offered), Vidrepur, Aim, Kolorines and Mosai and Co. Ceramic lines offered are Fujiwa, National Pool Tile, Dal Tile and Artistry in Mosaics. For shell and gemstone, we are the U.S. Distributor for Mactan Fine Shell and Aqua Imperial Shell and Semi-Precious Gemstone. Areas where our designs are used: all tile pools and spas, swimming pool bottoms, vanishing edge pool walls, waterlines, pool interior lounges, bars and tables, swim outs, steps, deck inserts, medallions, fountains and entertainment area walls, outdoor kitchen counters and backsplashes. For home interiors we provide standard and custom flooring, kitchen backsplashes, bathroom showers, tub faces and surrounds, fireplace faces, countertops, vanity tops, walls, ceilings, columns and accent murals. We have been responsible for the artistic design and creation of pool projects within the continental United States, Hawaii and the Caribbean. Our expertise makes us uniquely qualified to provide highly specialized advice and artistic design services. We put our thirty plus years of experience in the field of hard surface mural creation, design and installation to work for our clients. We invite you to choose Agape Tile and let us turn your dreams into reality. Backyard Resorts Pools and Spas, Inc. Cool off with help from Pools by George, a family-owned business of pool and spa contractors based in St. Petersburg, Florida. Our full-service company will take care of all of your recreational swimming needs! Our family has been building pools for 47 years. We have the most experience in the pool industry in our area. We are an affordable, custom builder. Resurrection Pools, LLC is a local family owned and operated company who specializes in pool and deck renovations in Charlotte, Lee. Sarasota, and Manatee counties. We offer over 25 years of experience as well as a commitment to give exceptional service based on hometown values! Resurrection Pools, LLC specializes in competitive pricing and offers a wide variety of quality products and services to choose from, including: Exposed aggregate pool surfaces ranging from 10-year to lifetime warranties Pool retiling - tiles supplied by Luvtile and other top quality suppliers Pavers - we offer a lifetime manufacturer warranty from the three largest paver suppliers in the area Other deck surfaces - Cooldeck, Spraycrete, Knockdown, stamped concrete and custom decks And much more! We take pride in having the highest quality workmanship in the area,and offer exceptional customer service. From start to finish, our work is done professionally with expert care and quality. Our focus is to work with you to get the best final product possible. When you have a pool, spa or deck that needs a little extra TLC, choose the best, choose us! Choose Resurrection Pools, LLC so you can rest assured you will get the highest quality craftsmanship and unparalleled customer service - you deserve nothing less! If you have an a backyard that needs resurrecting, please call Resurrection Pools, LLC at (941) 623-8459 or fill out the contact form on the last tab of this website. We provide free estimates. What exactly do Venice pool builders do? If you are planning for a new pool in Venice, FL, a swimming pool builder will analyze your outdoor space and your aesthetic wishes to determine an appropriate design for your yard, installing it once the plan is developed and approved. Once installed, some pool companies in Venice, FL can handle the necessary cleanings, water testing, renovations and equipment replacement or repairs for your pool or spa. If not, many can also suggest Venice, FL swimming pool contractors or maintenance services to help with upkeep or repairs down the road. Here are some related professionals and vendors to complement the work of swimming pool builders: Garden & Landscape Supplies, Landscape Architects & Landscape Designers, General Contractors, Landscape Contractors, Solar Energy Contractors. Before hiring a swimming pool construction company to create your new Venice, FL pool, determine how you'll be using it. Will it be for fun or for lap exercise? Will the primary users be children, adults or a mix of the two? Knowing the use can help you find Venice pool builders who shares your aesthetic. Once you find swimming pool builders in Venice, FL who share your style, research is critical. Review customer references and comments, collect at least three to four estimates to compare, meet with potential Venice pool designers and builders in person and ensure that they are Florida certified service professionals and licensed with the registrar of contractors before making any final decisions. In addition, get a sense whether they plan to complete the pool installation and be done with it, or whether they seem interested in building a long-term relationship with you. Be wary of the former: it's likely a reflection on the level of quality of the pool construction they do. Find a Venice pool contractor or designer on Houzz. 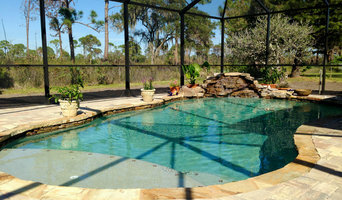 Narrow your search in the Professionals section of the website to pool builders in Venice, FL. You can also look through Venice, FL photos by style to find a pool or spa you like, then contact the local pool company who designed it.